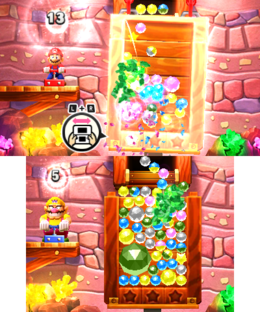 Jewel Drop is an Extra minigame from Mario Party 10, and returns in Mario Party: The Top 100. The minigame itself is a cross between Columns and Tetris. Like Block Star, Stick and Spin, Castle Clearout, Three House, Emergency Hexit, and the Mario Party DS versions of Mario's Puzzle Party, Bob-omb Breakers, and Piece Out, it can be played alone or with another player. The player is in a mine, with crystals coming out of a conveyor and into the player's basket. The player must link four crystals of the same color to make them disappear. There are a few crystals that appear in the shape of a star, that gives the player a star whenever it is linked to three other crystals. The star allows the player to shake the basket to possibly link a few more crystals together. Additionally, in Multiplayer, bigger crystals will fall against the players' command. If it is linked with three other crystals, it will begin to shrink in size until it reaches normal size. In Single Player, once a crystal falls out of the basket, the game is over. In Multiplayer, when a crystal falls out of his or her basket, the other player will win that round, and the first player to win two rounds wins. "Connect 4 or more jewels of the same color to make them disappear!" Description – "Connect 4 or more same-colored jewels to clear them!" On-screen (Vs. mode) – "Clear jewel combos to drop unwelcome jewels onto your rival's field!" On-screen (Endless mode) – "Connect 4 or more same-colored jewels to clear team!" This page was last edited on October 11, 2018, at 07:12.